Four members of the Agazi Forces, the special squad of the TPLF regime, were killed in an ambushby armed farmers in the restive Oromo region. 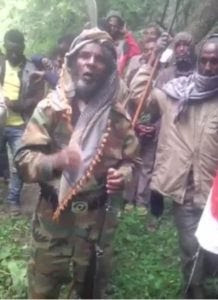 According to a video received by ESAT and interviews conducted with residents of the area, one soldier was also captured by the farmers. The regime has reportedly sent a reinforcement to get the release of the captured soldier. The farmers have seized the weapons of the deceased and went to hiding. The ambush took place in Ajo area of Arsi, in a locality called Kesisa, according to the video statement. The video showed a man purported to be the leader of the group, who took part in the ambush, saying they have carried out the attack in response to the atrocities committed by the regime against innocent people. The people in the area have vowed to engage the regime in armed struggle, according to the video message. The video statement added that the people are infuriated over the unrelenting attack by the dictatorial regime against the people of Oromo and the Muslim community that’s peacefully conducting its religious duties.